It was 7.00 AM on a sunny Saturday Morning in Montvale, NJ. My friend Madan woke me up and asked me to get ready fast. He said "We have train to NY at 9.28 and the next train is at 11.15". He also added “To catch the 9.28 train, we need to leave the house at 9.24” as it would take three minutes to walk to the train station and one minute to purchase the tickets. He was very precise on the timings. I wondered on how exact he can be on timings. I got ready fast and was having my breakfast by 8.45 AM. Soon Bhaky and Vijay joined me for breakfast. We finished our breakfast and were getting ready to go out. Meanwhile Madan was checking on the Amtrak website for the connecting trains. At 9.23 he shouts “We need to leave the house fast, the train is at 9.26 and not 9.28”. Just 3 minutes to catch the train. He started running out heading towards the station. We started running behind Madan. Soon, we were very close to the train station, the signals were on and the train was arriving at the station. The train had just arrived, and the doors opened. The conductor got out of the train to check if someone is boarding the train. He noticed us running on the platform towards the train. He said “Come on, Hurry up!! !” We all ran fast to get into the train. Madan had stopped by at the vending machine to get four tickets to WTC (World Trade Center). I shouted, “Madan, make it fast”. Madan signaled “Get into the train I will join you in a moment”. We boarded the train as Madan swiped his Credit Card for the tickets. The machine took at-least 10 seconds to get credit card approval. We were all yelling at Madan, “You, Maddy, make it fast”. The vending machine started printing the tickets. For each ticket the machine would have taken close to 2 seconds to print. The machine dispensed the tickets one by one. Ticket one: Madan takes the first ticket and waives his hand. Then after a pause, the next ticket (second one!!!). Then the third ticket was printed. Madan shouts “Just one more to go”. The conductor signals the train. He was staring at the machine for the last ticket. Yes!!! The machine printed the fourth ticket; he quickly grabbed the ticket and started running towards the door. He stepped in and thanked the Conductor. All of us had a smile in our face, signaling that we all achieved something great. The truth is luck had favored us. Had we been late by another 10 seconds, we would have missed the train. What a timing Madan!!! Hope you enjoyed this Blog. The best of my blogs are yet to come. Keep watching!!!. Do leave me a comment. I realized that we all need a lesson in time management. Here is one from Randy Pausch. Hope this is useful. I was eagerly waiting for my friend Bhaky (Bhakyaraj) to return from office on Friday. I have asked him to get some printouts of Maps and Sites to see in NY. Bhaky called me and said that he has started from Office and would reach home in another 30 mins. In the meantime, I was replying to some of my mails. Bhaky reached home in 30 mins and got ready pretty quick. I asked Bhaky to take his car as I was tired driving for 12 hours. Soon we let the place and started to NY. Bhaky was driving and heading towards Vijay’s place. There was a huge traffic on the road. Bhaky managed to change lanes often to make sure we were always on the faster lane. We reached Vijay’s place and called him down to guide us to the parking lot. The parking charge was 22 USD for 24 hours. We decided to park outside on the road, as it was legal to park on the streets here. We found a place on the street to park, where the sign boards were confusing. The Sign board had “No Parking with an arrow upward” We thought it was a no parking area though we found a car parked on the same lane. We started hunting for alternate parking places. The next parking we could get on the streets was reserved for some companies/apartments. Frustrated Bhaky came back to the same place again to park the car. Now he read the sign board carefully and it was no parking beyond the post. That is why we had the arrow upward. After Bhaky’s analogy we parked the car with confidence and proceeded to the closest station. From there we took a train to the Times Square. We reached Times Square station. 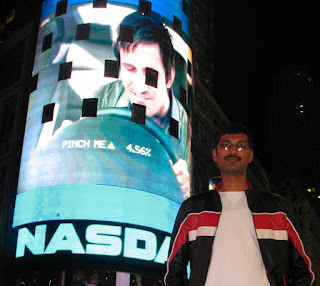 Madan had come down to Times Square waiting for us. Soon after three phone calls we met Madan. I greeted him with a hug and we started exploring NY. We started walking towards the brightest lights near Times Square. Times Square was one of my dream destinations for years. As I walked through the Times Square, I felt great as I visited one of my dream destinations. In no time we got busy taking pictures. We noticed a tall girl near Times Square. My friends were pushing me hard to ask her for a photograph with me. I did not have guts to ask her for a photograph. By the time I gained confidence, I realized she has moved away and was no longer in our sight. It was 8.30 PM. We all ran into the Debate of Madame Tussauds vs Ripley's Museum. Madan preferred to keep Madame Tussauds for the second day as it would close down by 10.00PM. I was confident that we can make to Madame Tussauds in hour and half. I wanted to get this off my list on day one as we could save more time for the next day. Bhaky had been to Madame Tussauds once, he put his view point that it would take more than 3 hours inside. Experience Triumphs!!! We all decided to see Ripley’s Museum and it was open till 1.00 AM in the morning. As we were deciding to go to Ripley's Museum, Madan reminded us about the dinner. Soon we decided to take dinner and get into the Museum. We started searching for some restaurants as we were walking around the Times Square. The only one we could spot easily was McDonald's. Soon we were proceeding in queue at McDonald’s to make our order. I was standing in line with my friend Madan. Bhaky and Vijay were standing outside the line busy watching the Menu boards and discussing with Madan on their orders. As we progressed to the Cashier, Madan started ordering and he asked me on what I want? I did not find any veggie item in the Menu. I asked the cashier “Do you have any Veggie item?” The cashier promptly replied “Yes Sir!!! We have Fish.”. This was not the first time I am hearing such reply in US. I asked her “Do you have something without meat or Fish”. She scanned through the menu and said “Sorry Sir. We don’t have”. Soon we all decided to find another restaurant. Madan asked her to cancel the order. We stepped out of McD and started to look out for other restaurants. We found TGI Friday’s in the same street. It was so quick that we all decided TGI and we started heading into TGI. As we stepped inside the restaurant, I could smell only meat. The restaurant was fully packed and we were guided to the second floor. As we walked to the second floor the stench of meat started to increase. Soon I was not in mood to tolerate the smell. I asked my friends that we better find out another restaurant as it would be difficult for me to eat in such environment. My friends agreed to find out another place. We started to search for a better place and we found another McD. This McD was bigger than the first one. We thought we could get something Veggie here. We all stepped in and found no Veggie item. I decided to go for French Fries and Orange Juice as we were all tired walking. At last we ordered and had our dinner at McD. (Later we reached Madan’s house at around 2.30 AM. We had another round of dinner - Indian food :)). It was close to Midnight as we left the Museum. It was an ultimate experience inside the Museum with all the odds in life. Especially, the experience in Black Hole was Thrilling. The plan was to go to Madan’s place for the night. We started back to the closest train station. We reached Vijay’s apartment soon. We had a clear view of the Manhattan and the Status of Liberty from Vijay’s room. The view was amazing!!!. Vijay picked up his bag and we started to Madan’s place. We had another round of dinner in Madan’s house before we went to bed wishing Good Night!!!. Thanks for your time. Do stop by again. There is more to share on my New York experiences in the next part. Your comments are most welcome. I have been thinking for long time on starting a blog. My recent trip to New York served an icebreaker to start a blog. And perhaps this is my first blog!!! Hope you enjoy reading it. Feel free to leave a comment. I wanted to visit my friends in New Jersey and go along with them to see New York. I was planning to take a flight to Newark international airport over the weekend. Spring has started and the flight tickets were quiet expensive. The only option I was let with was to drive to NY. I was searching on internet for distance and route to drive. According to Google maps my friends place in Jersey was 701 miles (1128 kilometers) and it was about 11 hours 8 mins drive from Knoxville. I calculated on the gas (petrol) prices and the cost to travel for my trip worked out to be 70 percent cheaper than flight tickets. Preparing for my trip: I worked hard to complete my project tasks for the week. The week went pretty fast. My plan was to start around 5.00 AM on Thursday morning. On Wednesday after my work, I went to Walmart and got lot of snacks, water and soft drinks. I had to buy all these to make sure I do not sleep while I am driving in the car J. I was really tensed on Wednesday Night. This was my first long drive in US. And also I will be driving alone for 12 hours. With all these thoughts running in my mind I slept for about 4 hours only. I woke up at 4.30 AM as planned and it took me one hour to get ready. I finally started at around 5.45 AM. When I started my car, I was feeling tensed. But I was free from tension as I moved my car out of my parking lot. I had 10 CDs with Telugu, Tamil and Hindi songs to kill my boredom while driving. I was always scared of driving along with the trucks on the highways. The trucks were gigantic and atleast 70 foot in length. I was feeling anxious every time I overtook a truck. Another thing I was worried about was, when a truck moves to the left most lane to overtake another truck. When you see in your back mirror you feel as if an elephant is chasing you. But soon I got confidence and was driving in comfort. Other think that helped me while driving was cruise control settings (that will hold the car at the chosen speed without having to accelerate). I was not aware of this till my friend explained on this over phone. I was searching for manual in my car to read about cruise control. This was a rental car and the manual was missing. Anyhow I learnt on how to use it as it was clearly written on the buttons. I had to experiment on it on the way with wild guesses and to my surprise everything worked as expected. In the first six hours of drive I had already taken 5 breaks. Every break I took was delaying my reach in Jersey by 15 mins. I decided to take only three breaks including one for gas (petrol) for the remaining 6 hours drive. This worked out as planned and I was 18 miles away from Jersey. I made a small mistake here, I took the wrong exit and was on the highway to New York instead of the highway taking me to New Jersey. I called up my friend to direct me over phone (as I did not have GPS). As he was not in front of computer he was not able to help me. Soon I took one exit and stopped my car at a mall and asked a gentleman about the route to Edison, New Jersey. I got the required information and started again. I called my friend to say I was fine and will reach in 30 mins. I drove to the NY highway as instructed by the gentleman. And in 2 miles there was an exit to New Jersey highway. I was very relaxed and followed my map to reach my friends place. I reached a place very close to my friends apartment. I was not able to locate his apartment. I parked my car near an Indian restaurant and called him up again. He said I was in the distance of 2 mins walk from his place. He soon walked down to the Indian Restaurant and guided me to his house. I was feeling safe and relaxed. I called up people to inform that I reached safe in New Jersey. I reached the place around 6.30 PM (After 12 hrs of drive!!!). I was proud that I made a succesful long drive. I will write about my experiences in New York in my Next Blog. Thanks for spending time reading my blog. Do leave me a comment.